Size (inches): 2.36" X 4.72" X 5.12"
Just squeeze his tummy and he squeeks! 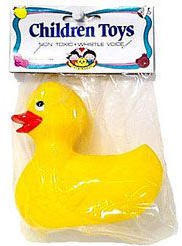 This Yellow Duck is the definitive "Rubber Duckie" that will provide laughter and amusement for your little one in the tub. Brightly colored, but NON TOXIC, this little duck is the perfect bathtime companion - and priced right! I am very happy with my rubber duckie which I will use when singing 'Rubber Duckie!' Thanks.